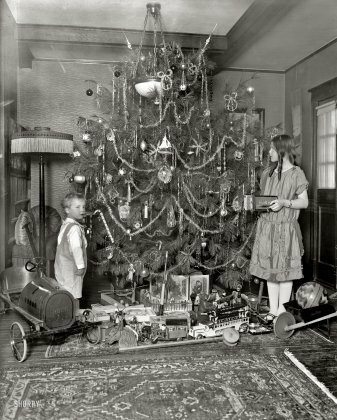 Vintage Christmas photos from the 1920s. 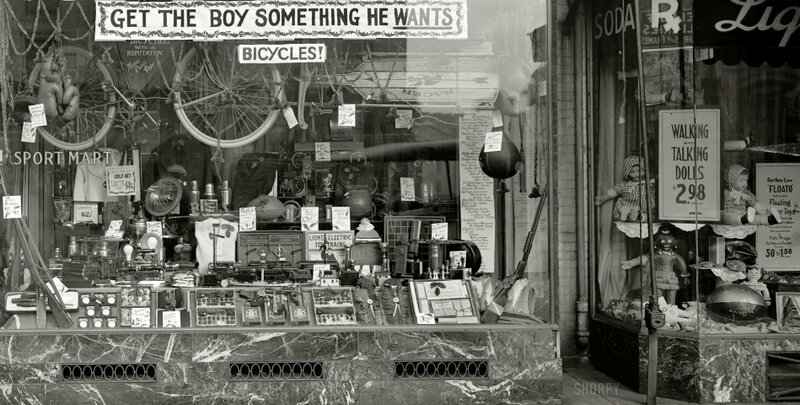 A classic '20s storefront! 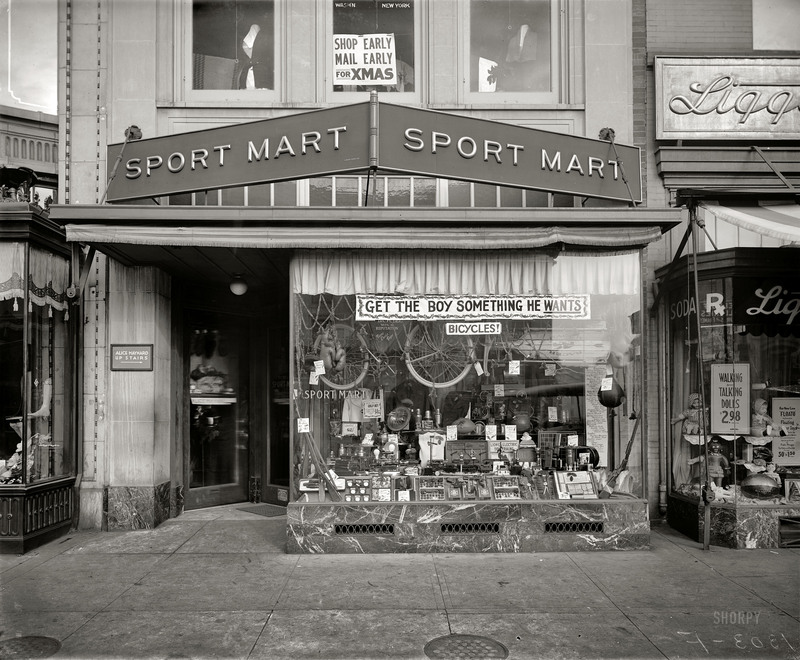 This is the Sport Mart at 1303 F St. 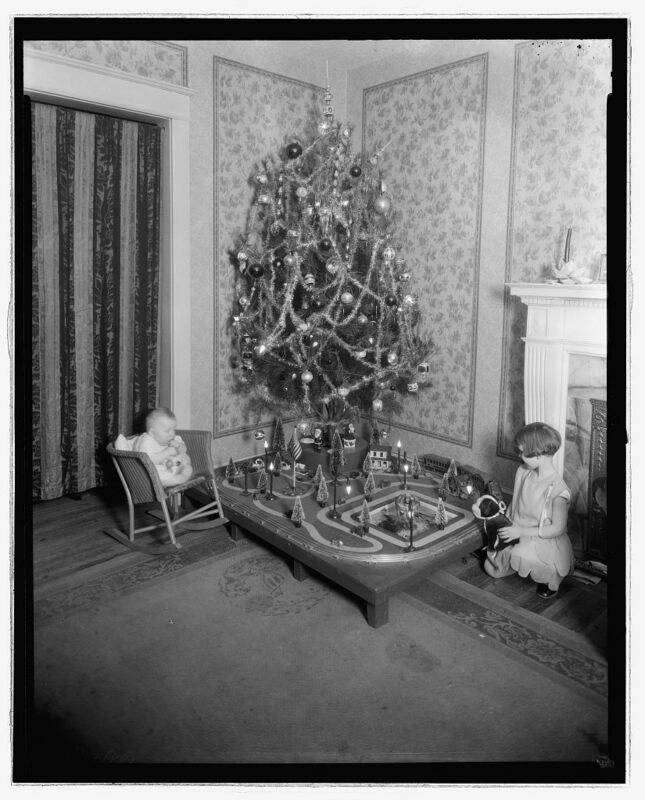 N.W., Dec. 1923 in Washington D.C. 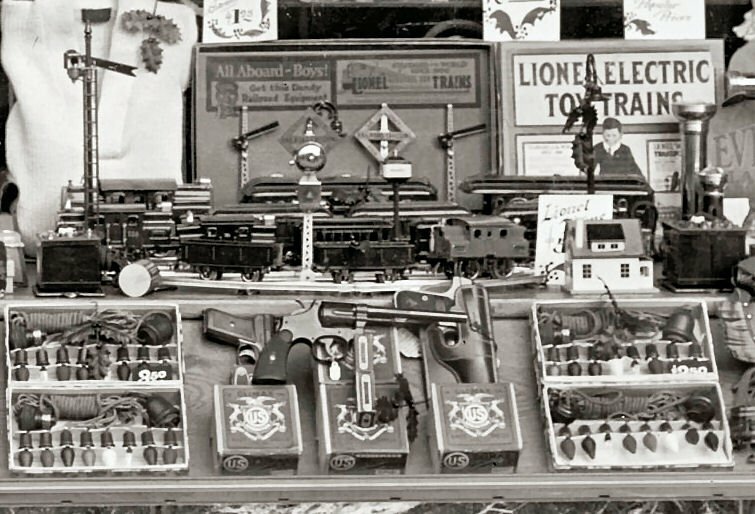 Here you see a portion of the Lionel "Early Period" line as it was between 1919 and 1924 - as they were displayed and sold in their Day. 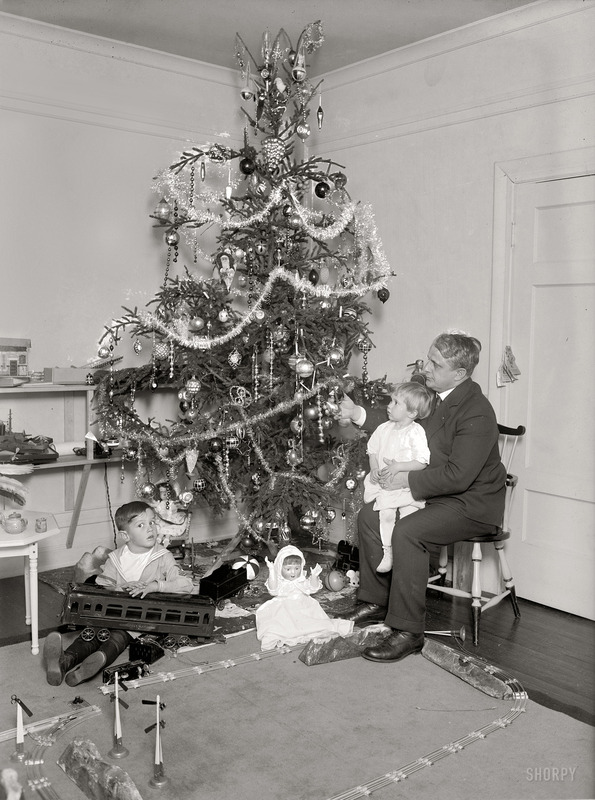 Lionel began transitioning to a whole new line and look of trains in 1924. "0" gauge trains in the foreground - one Standard Gauge set in the rear. 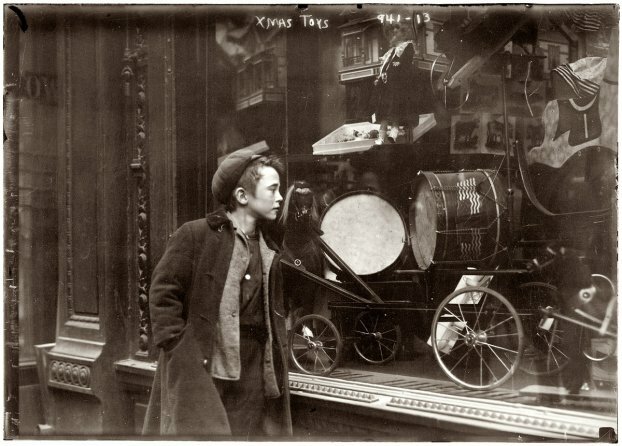 And just look at all the other great toys in this window! That's no cap-gun in the center, either! 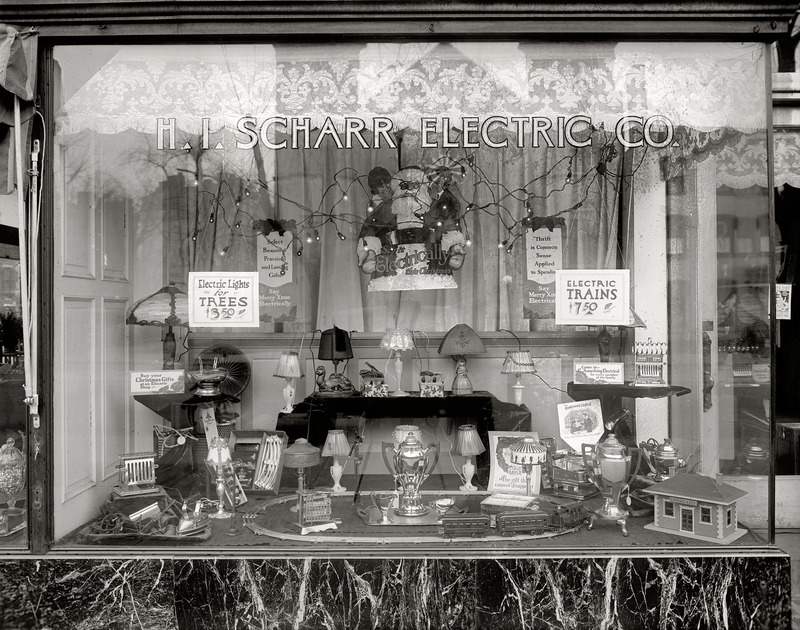 Another storefront, same era. 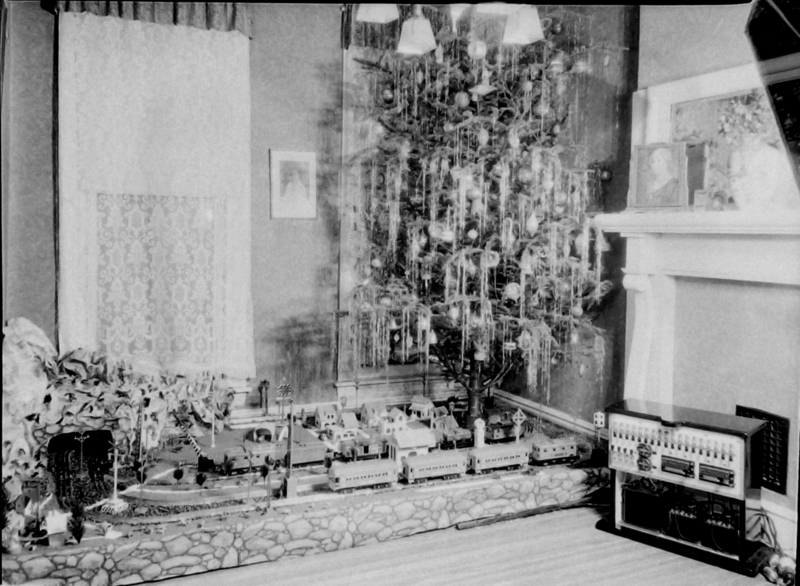 That's Lionel's largest 0 gauge train set prior to 1924, but missing one car. Notice the odd-looking early Christmas lights strung across the top of the window with the exhaust-tip bulbs. These are either carbon filament or the very earliest of the tungsten types, putting this picture earlier than the one above. This is also in Washington DC - photo dated 1921. 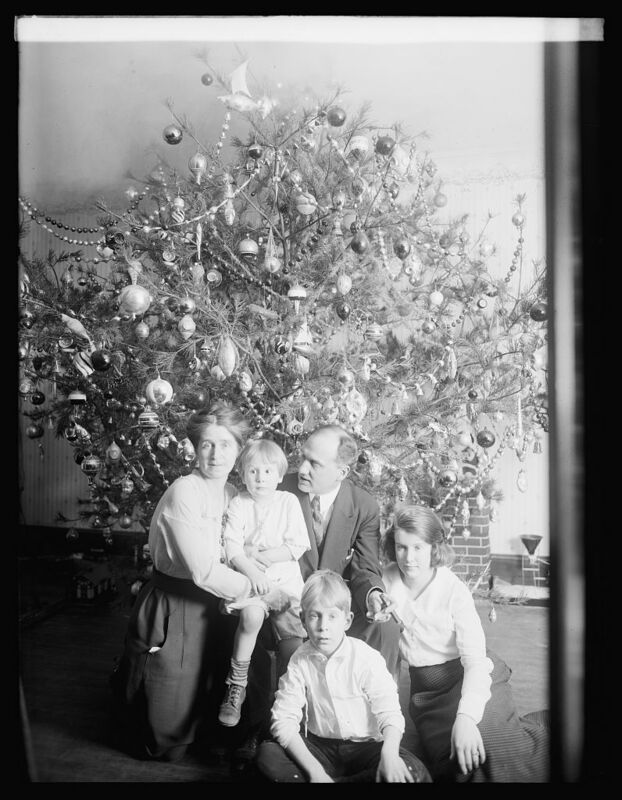 This is the Dickey family of Washington, D.C. in 1923. Mr. Dickey was a prominent attorney. Hauck Family. No other information available. This same picture turned up colorized. Whoever did this did an amazing job, but I preserve the black and white version because whoever did it could have had no way of knowing the original colors of all those ornaments and so on. 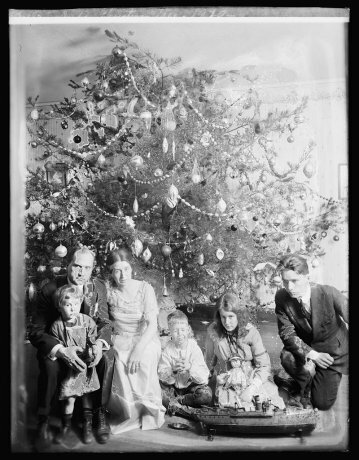 The Dickey family again - 1921. 1921. Remember Santa in space ships in the '50s? This is a publicity shot for a TB drive. Before we had penecillin, TB was the AIDS of Pre WW II days. Terribly contagious, you could pick it up from a pay phone or at the movies. Drives went on incessantly. 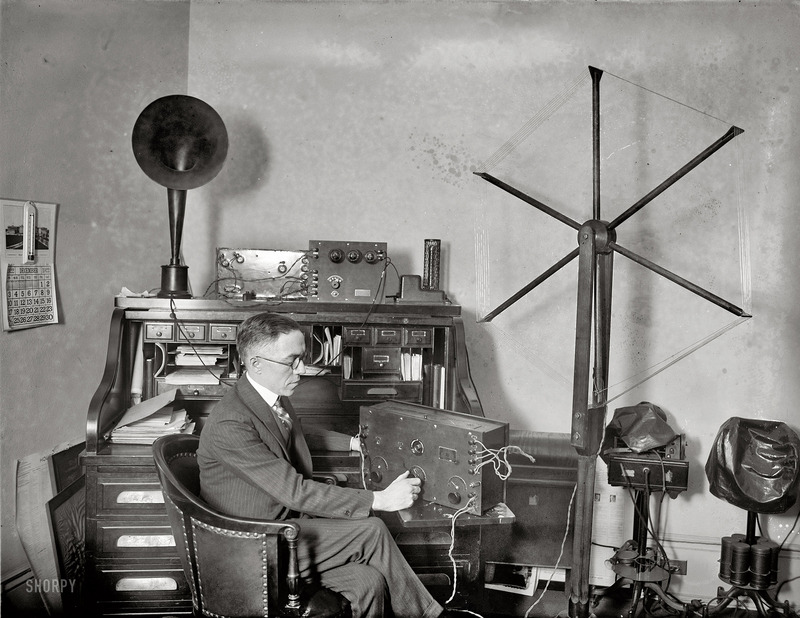 Dec.19, 1922 - Washington, D.C.: Rep. Vincent Morrison Brennan, R.-Michigan, eavesdrops on House proceedings via modern, convenient AM radio. The Dickey family again - 1929. That wind-up tin ship on the floor is to die for with collectors. They fetch prices beyond those of the rarest old trains today because guess what? They were meant to float on water and most have long since rusted out or were sunk! - but true works of beauty in their day. Dated 1924. "1,000 Toys in One." 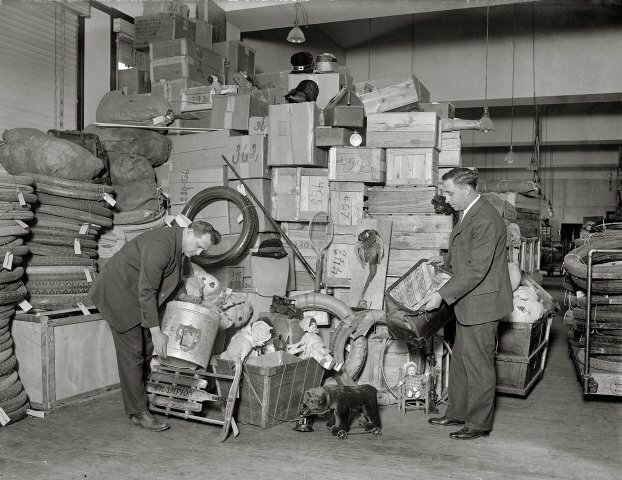 Although this photo was labled "1947," I didn't believe it. 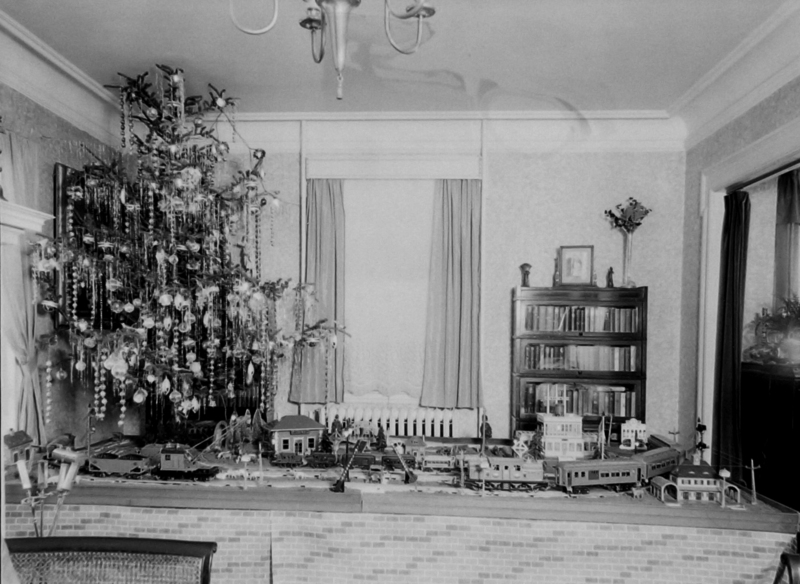 That Lionel train and everything else I see are early 1920s. 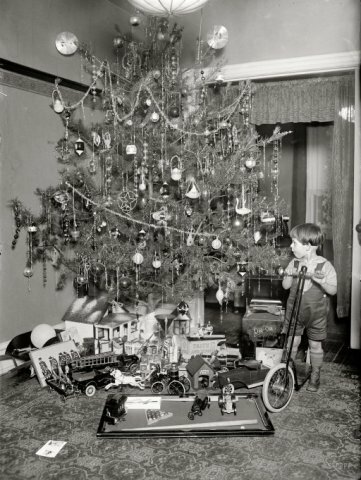 But in the blowup you can see an Auburn rubber toy car - definitely 1940s -the only giveaway. I'm leaving the picture here, anyway. Scrutinize the kids. Some seem to have dirty faces, but really their cheeks are chapped by the cold outside and the dry hot air of steam heat indoors. A common problem in those days that was taken as normal. 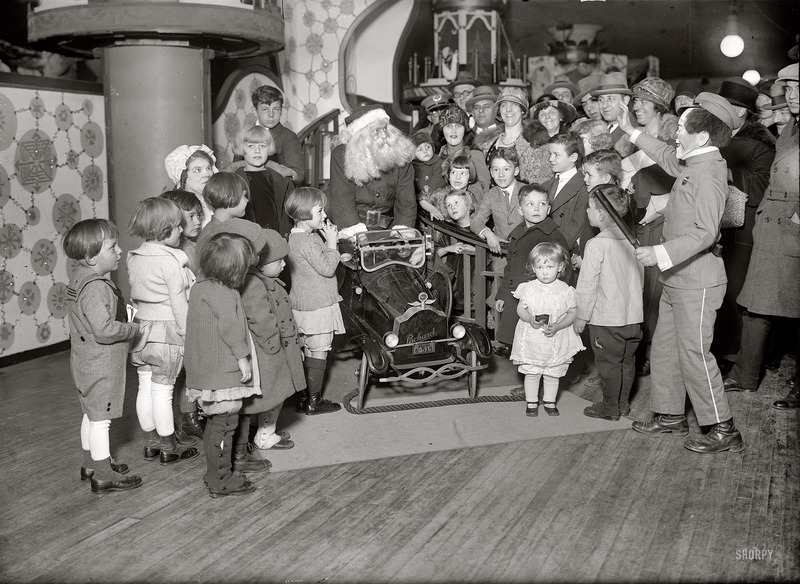 This is Macy's in New York - 1925. 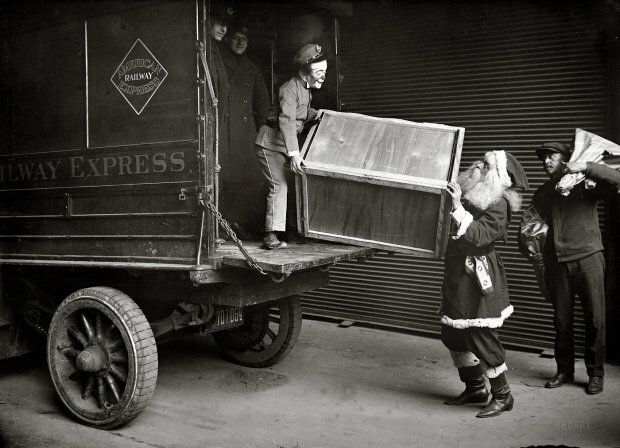 Christmas in the Postal Dead-Letter Office. 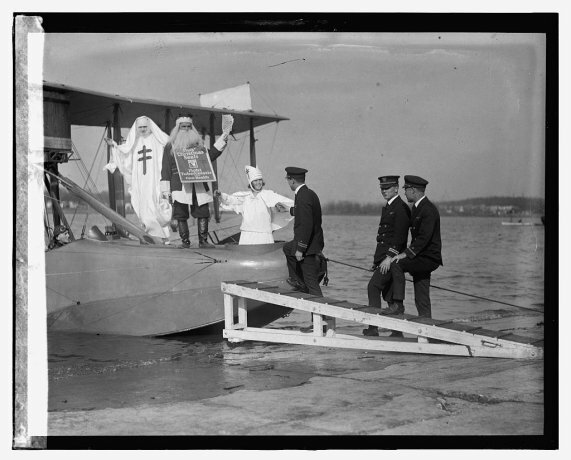 Also 1925. 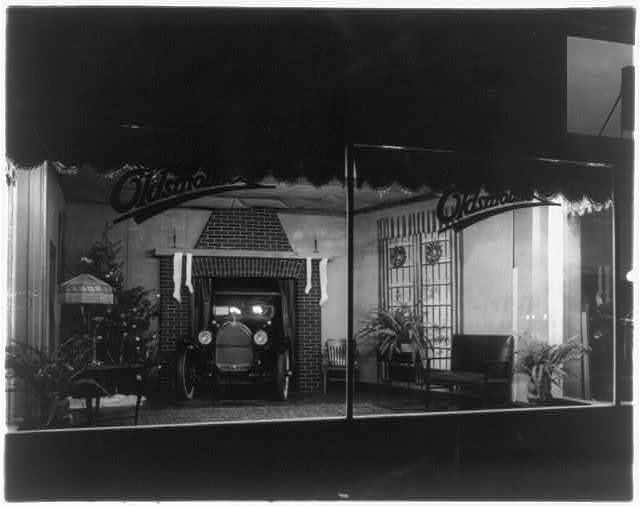 An Oldsmobile dealership in 1921 - down the chimney and out! 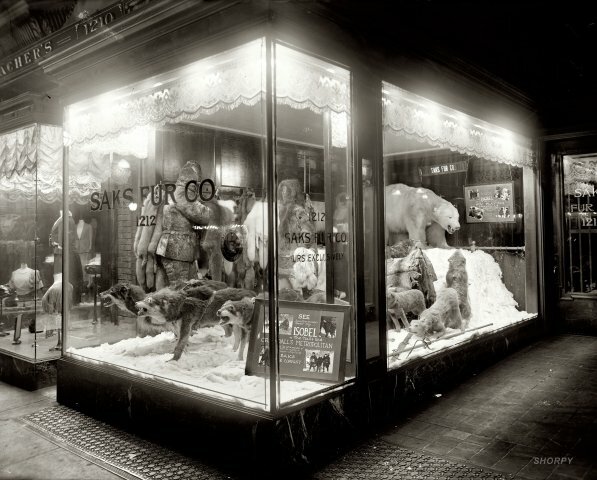 Speaking of Christmas windows .. Saks Fifth Avenue, Dec 1920. Sorry, PETA: Those were very different times. 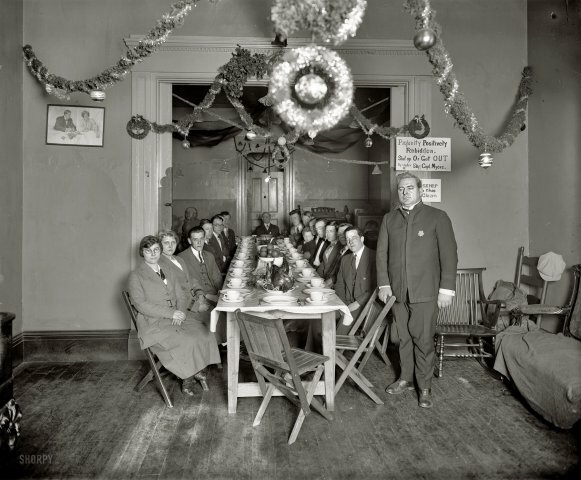 Here's a fun Christmas party ..Volunteers of America - 1925. 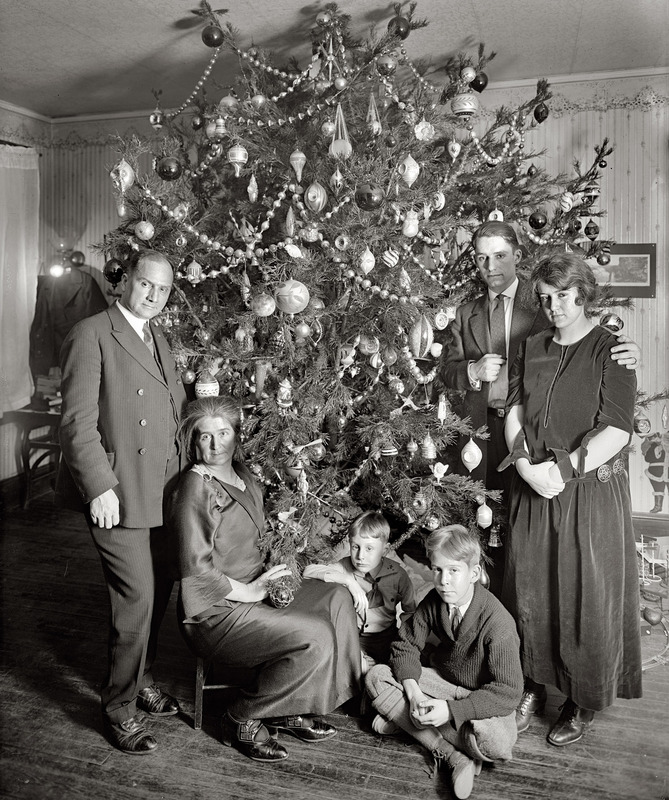 Their facial expressions seem as dead as that poor tree. Scarcely a needle left on it. 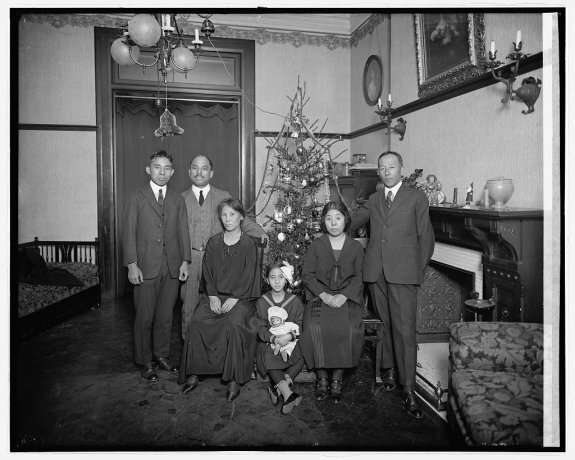 Christmas 1921 for the James J. Davis family of Washington DC. The boy seems mystified as to why that big Pullman car floor toy won't fit on the American Flyer "O" gauge track. A rather modest Christmas for the U.S. Secretary of Labor under Harding, Coolidge, and Hoover, wouldn't you say? A modest, but very tidy putz dated 1928 with a Lionel #253 engine pulling two "Classic Period" 610 cars.... and for the first time - a couple of very small Japanese cardboard houses! And don't you love the little "penny-toy" cars and trucks? Some of those could even have been Cracker Jack prizes. I can remember getting neat little metal toys from Cracker Jacks in the 40s. The prizes must have been even better in the '20s. Those street lights are very simple bent and straight metal tubes on metal dish bases that came in sets of 8, as they were really a C-6 light-string in disguise. 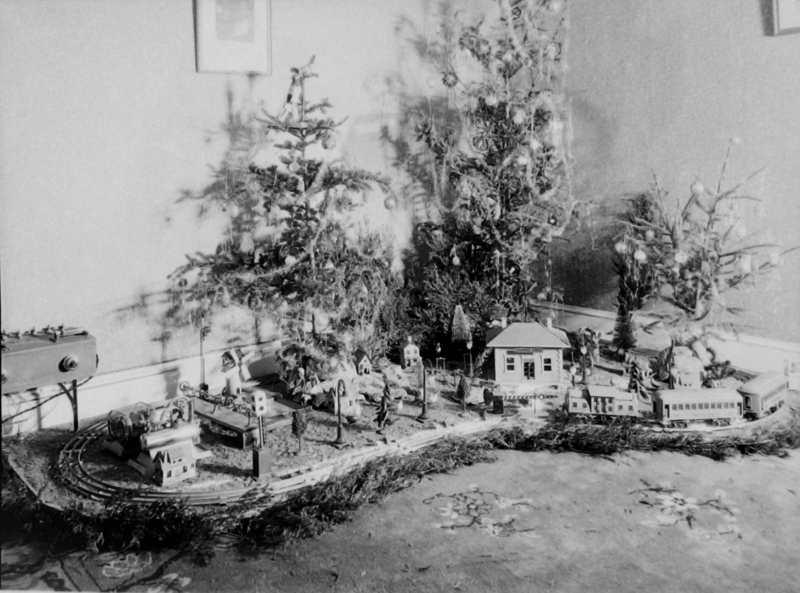 They were very inexpensive compared with the fancy Lionel and Ives train accessories and are still often found. Some say they were "Noma," but i don't know. 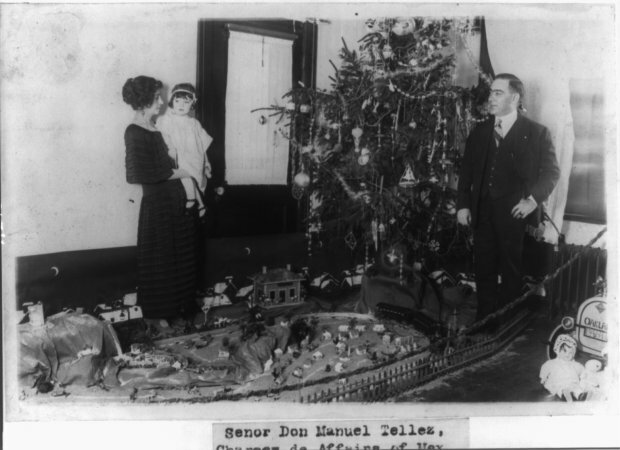 Dec 16,1923: Don Manuel Tellez -"Charge de Affairs" of Mexico - and family. The little girl is "Emily." 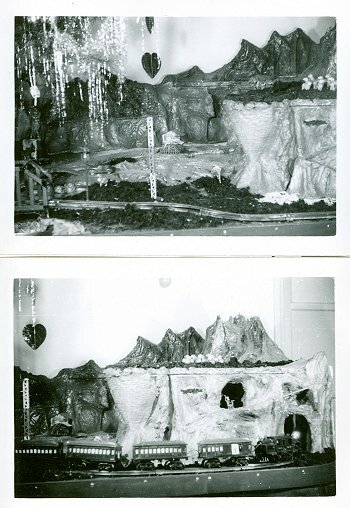 Did i say the "first Japanese cardboard houses" in the previous photo? What are these little houses all over the Tellez's putz? Gosh, i wish the quality were better! (New Dec 2009 This one was sent by Rob Shoeberlein of the Maryland state Archives with the vague date reference that it was taken before the 1920s, but there is absolutely no doubt in my mind that this is sometime between 1918 and the mid '20s. The boy's costume is a dead give away to the early Twenties, but mainly it's the train makes me certain. That's Lionel's humble #33 locomotive pulling three humble #100 series Standard Gauge freight cars. The #114 boxcar has been added to Lionel's smallest starter set #37. It still has just the circle of track that came with that set. ( 42" diameter circle for size reference.) Production of this "Early Period" style ceased in 1923. 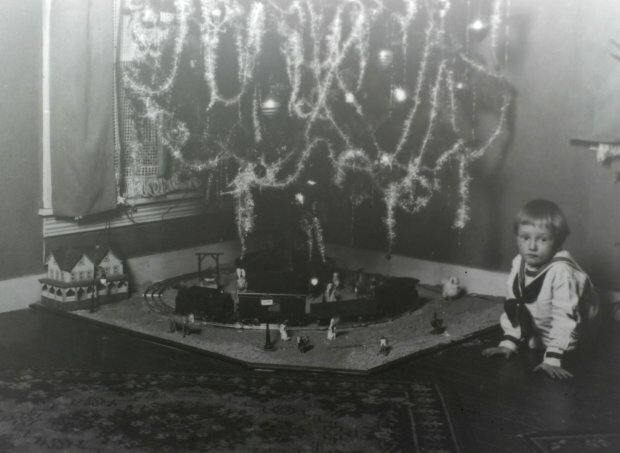 We see also see that the locomotive's headlight has been replaced with a C-6 Christmas light cone bulb, as often happened with the old trains because they fit the same sockets, and those style bulbs were not available pre WW I. 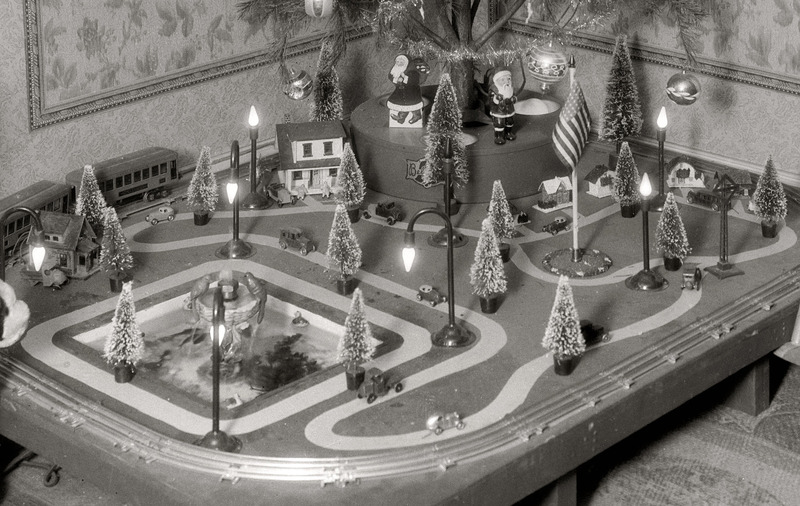 We also see three of Lionel's street lights - two #58s and one #57 "Broadway." These streetlamps were available from the mid teens to the 1950s, but not that kind of train. 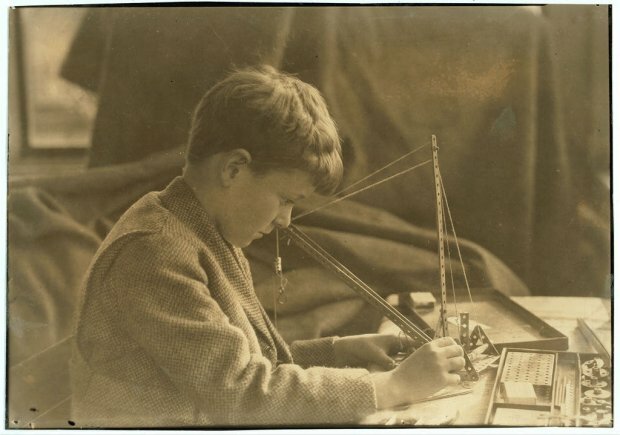 These early sets were rather tinny and poorly engineered, but nevertheless expensive!" That set without the boxcar sold for $18.50 - that's easily the equivalent of $250 today - and came with no transformer. There were too many different kinds of power across the country to include a transformer that would work for everyone, in those days, and many homes had no electricity at all. My late Uncle Jim Sutter had the passenger version of this set as a kid, and ran it from a car battery. 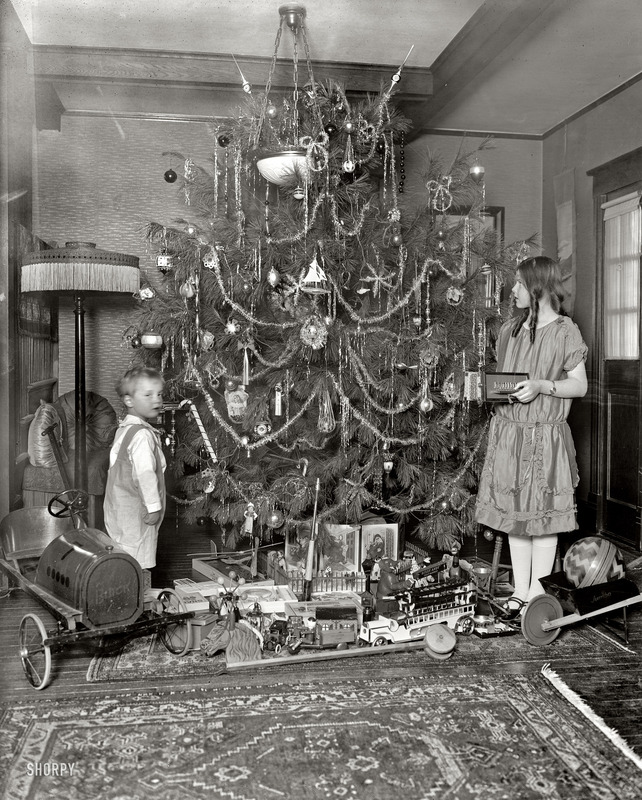 The acid ate a hole through Grandma's rug and into the floor and we heard the story of it every Christmas ever after. Here's a larger Lionel set from the same period. The #50 locomotive shown pulling #35, #35, #36 cars was only made in 1923 and '24 - a medium sized Early-Period engine, one of two to feature the new, improved "Super Motor," which was to power Lionel's golden "Classic Period" beginning one year later and continuing to about 1937. This picture gives a good idea how BIG this gauge of trains was, and it's by no means the largest model. 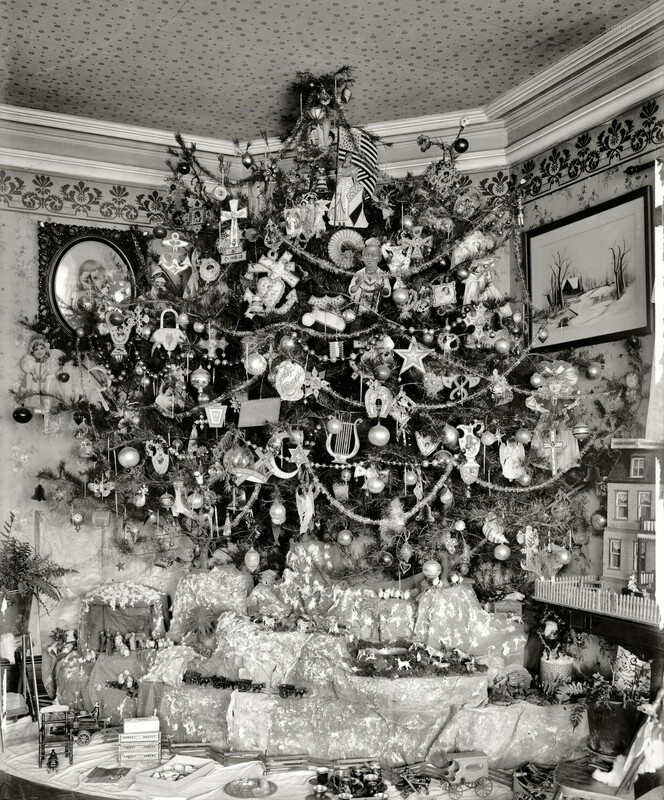 "A Keen Christmas - 1920:" The Christmas tree of Mrs. A.M.Keen, ca. 1920. 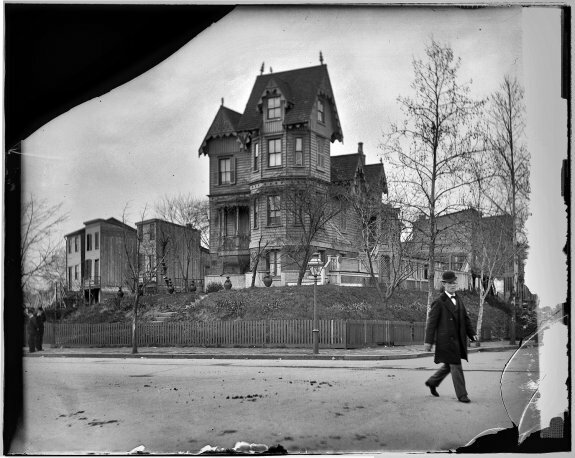 Washington, D.C.- Harris & Ewing glass negative. This putz could be from earlier than the Twenties. There is nothing in it except the minature light bulbs that could not go back to 1900, but even those bulbs are of very early types - doubtless carbon filaments with the exhaust tips exposed on top. 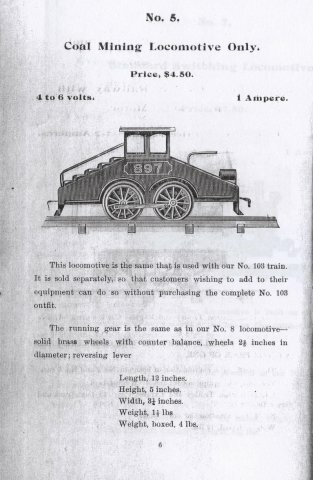 We have a catalogue page identifying that mysterious, strange locomotive going in and out of those tunnels on the floor. It's by an all-but-forgotten American train maker - name of "Howard Electric Trains"
In business from only 1904 to 1910, HOWARD was the first to have operating electric headlights on toy electric train engines. Their trains were quite high-quality and sturdy for the times. Each piece came in a dovetailed, slide-top wooden box. The track was sectional, but of a doomed 2" gauge. Talk about rare! 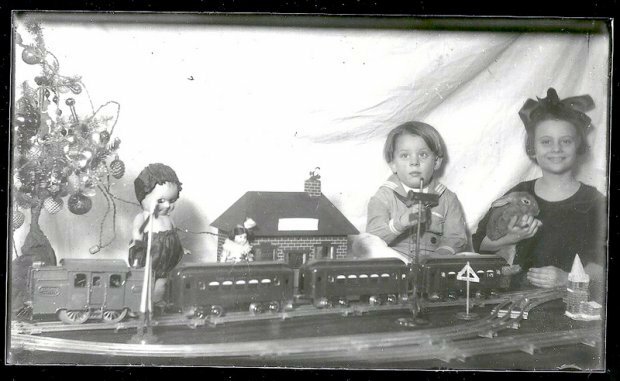 Train collector Dave McEntarfer who sent this and several other vintage pictures tells me that just 3 are still known to exist. It ran on 4 big dry cell batteries or 3 2-volt wet cells. It isn't possible to tell which year this page is from because HOWARD had the exact same catalog for all 6 of its years. Rob Shoeberlein has done it again. To follow are three more vintage Christmas displays whose train contents date them surely between 1924 and the Early '30s... the Lionel "Classic Period." They are three different displays appearing to be from three different houses. This is the stuff that train collectors dreams are made of. We have a big Lionel #402 or #402E (remote control reverse) standard gauge twin-motor locomotive pulling it's matched set of passenger cars #419,#418,and #490 - the size of big picnic bread loaves and with little swivel parlor seats inside. Flagship Set #403 or 403E in the 1924 through 1926 catalogs and continued throughout the decade. On the other end of the track, some freight cars have been added to the big set - the giant, unwieldly #219 crane and three of the smaller 500 series freights. On the inside track are a couple of Lionel's pre-1924 smaller 0 gauge trains. Behind the big #403 set is Lionel's grand and massive #840 power station, which can only be likened to a tin wedding cake. And the whole rest of the layout is just loaded with Lionel bungalos, villas and other buildings, accessories and lamposts. That appears to be a small German station in the right foreground ...Bing, perhaps. 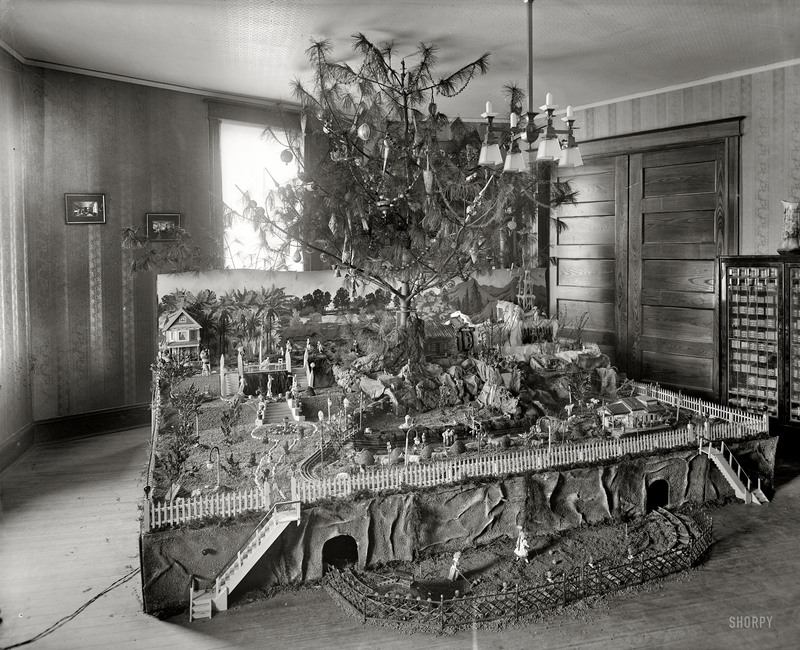 I like this one-train dogbone layout with it's three trees! It has charm. The train is headed by a Lionel #10 or #10E engine, Lionel's second smallest Classic Period standard gauge engine , the #8 being the smallest. That set usually has three cars... combine, pullman and observation. I only see two, here. We see a Lionel metal bungalo on the left - probably a #184 - and the widely found Lionel #122, not #124 station on the right. The difference was that the #124 had external light fixtures in addition to a light inside. 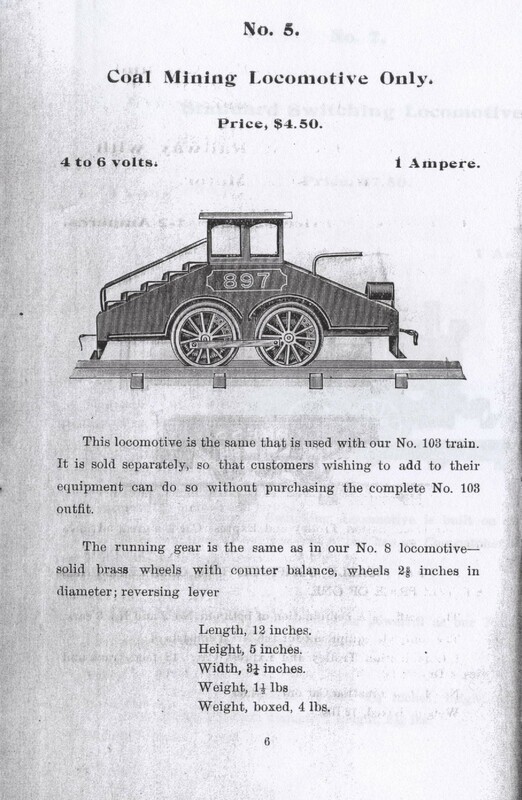 Otherwise, both were identical and of standard gauge size and sold for decades. And we see a couple of automatic signals and some other things. And again we have a very strange control box on the left - if in fact that's what it was. It could be a box to contain batteries and speed controls - if the house had no electric There seem to be no lights on the trees. But then - it may have nothing to do with the train at all. To tell you the truth - I have no idea what that thing is. Another proudly home-made contraption? Radio? A quack medical machine? But I suspect it worked the train. Of interest is that complicated stuff behind the bungalo on the left. That's a toy stationary steam engine apparently belted up to some wheels and pulleys to animate something - I see a little German tin windmill and pond, perhaps with a little fountain - and perhaps it's to pass for the local power station as well. 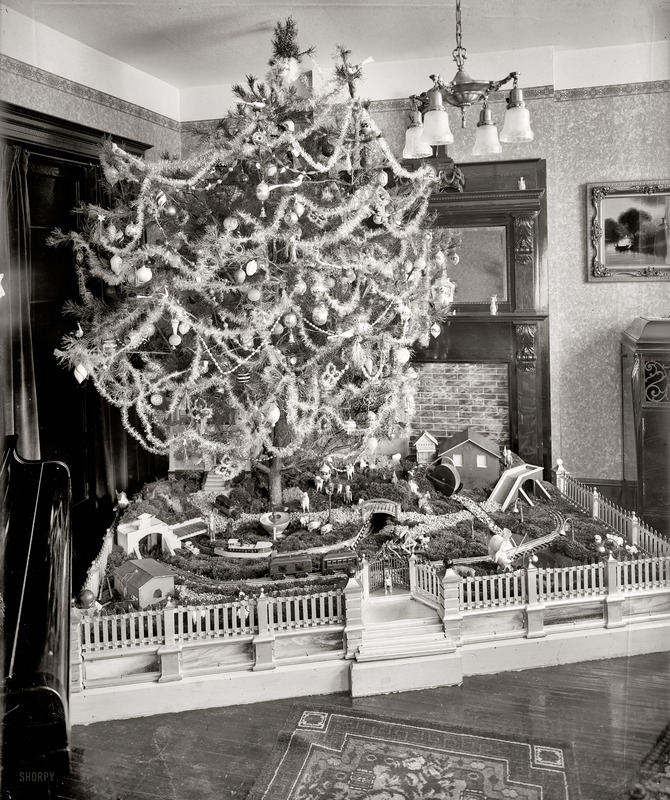 Not much Christmas showing, but this picture is dated Dec. 1921, Washington DC - a house built in 1876. Can you imagine the interior of such a place, of having Christmas in it? The negative is damaged, but I just had to include it. 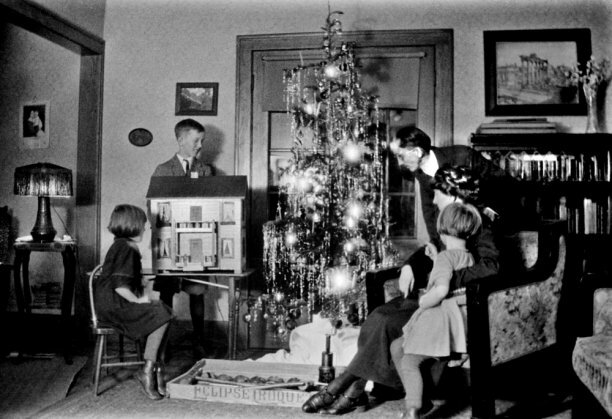 A Christmas 1920 - Washington, D.C. - Blowup showing exquisite detail.